This is the Lotus Esprit V8, the one of the last cars in the legendary lineage to carry the name. Production originally began in 1976, spawning several generations up until 2004. The body style seen here, dubbed the S4, debuted in 1993 and would be the last generation. The Esprit traditionally was powered by a four cylinder engine mounted mid-ship. A turbocharger was added to the previous S3 generation Esprit. It wasn’t until 1996 that Lotus decided to replace it with an all-aluminum, flat-plane V8, with two Garrett turbos, of course. 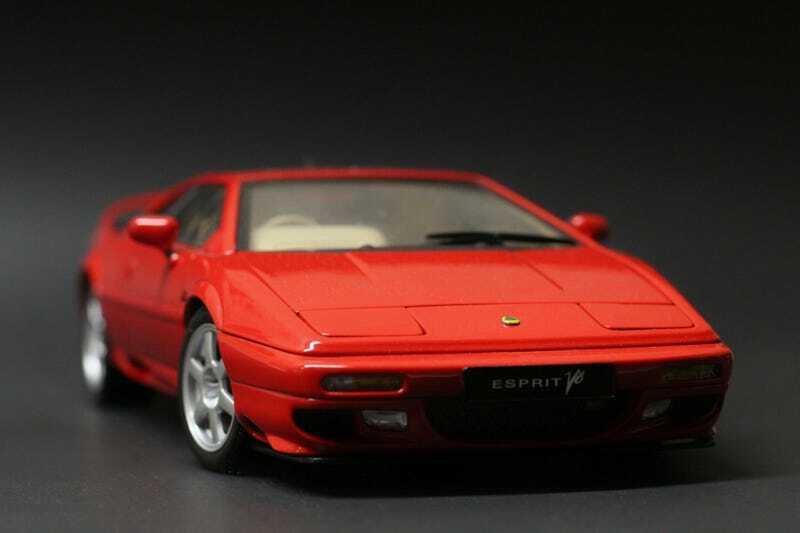 AutoArt’s model is based on the 1998 Esprit V8. The frunk swings upward to stow the spare tire and for access to coolant reservoirs. A small prop will hold the lid open for you, if you should choose to display this way. Of course my favorite feature has to be the functional pop-up headlights! I’d be willing to bet I’m not alone with that one. A toggle switch on the underside of the model activates them. Inside we find an interior consistent with other AutoArts of the same era. Carpet and detailed gauges on the dash are the highlights. But that’s not why you’re here. The exterior of this car steals the show. Julian Thomson’s interpretation of the classic Giugario wedge is among the best looking supercars of the 90's. Wedge? Check. Wing? Check. Pop-up lights? Check. I never had one, but I bet a ton of my fellow 90's kids had a poster on their wall. Naturally, AutoArt knocked this one out of the park in the proportions and panel gap departments. Taillights look familiar? They are borrowed from the AE86 Toyota. It wasn’t until 2002 when a face-lift brought about the iconic double-circle taillight lenses. I scored this one off eBay while hunting boxless bargains. I shot the seller an offer for $75 and he quickly accepted. Crazed excitement may have worked against me though, as this model needs a little TLC. I had notice that the small roof-mounted antenna was broken, but that wasn’t a deal breaker for me. It was either clever photography by the seller or my blind ignorance that didn’t pick up the missing exhaust pipe on the left. I definitely plan on doing a little restoration work when I get the chance. If you are more patient than I am, there are actually a few listings on eBay now for models with their boxes going for just a tick over $100. I wouldn’t recommend paying much more than that. Black seems to be the most commonly available, while yellow makes the prices get a little stupid.